Learn principles for living that come from yogic teachings and ancient wisdom, including mantra meditations and breakthrough relationships tools that will help you shift out of negative emotional patterns you may face in your relationships. Open to everyone. When we feel heard, significant, and truly seen in a relationship, we experience the magnificence of beauty and meaning in our lives. The splendor of being genuinely acknowledged by your beloved allows you to feel nourished and integrated with your true self. As a result, your soul is eager to shine the light of the true self upon family, as well as on a global scale. The essential ability to experience your relationship to your true identity is enhanced when internal communication systems are functioning optimally. These internal communication systems are located in the glandular and nervous systems. When balanced, you are able to consciously and peacefully communicate your deepest needs, desires and creative visions for a meaningful life with your family and partner. Balancing your internal communication systems is fortunately simple; the technology of mantra and alignment with your inner voice clears the path to allow love to reign in every relationship in your life. In this way, we become a magnet for blessings, even during the most challenging times. Woman is a powerhouse. Her capacity is 16x greater than that of a man. When she understands and develops herself, she becomes radiant and prosperous. Surrender and flow are her natural state when she is no longer ruled by her fears and neuroses. When she allows the floodgates to her Creativity to open up like a river, she is content, fulfilled and healthy. Attracting Prosperity is a three part process. This workshop will give you specific tools to deal with the spiritual, psychological and social aspects. Breakthrough tools to shift from lack to plenty. The law of All Sufficiency. Kundalini kriyas and meditations to call in abundance and remove negativity associated with lack consciousness. Chanting Meditations to uncover your Destiny and how it can take care of you. Step back into the powerful woman that you truly are by leaping over hurdles of self-limitation and into a space of overflow. From the mystical Valley of the Moon in Ojai, CA, a radiant duo blesses its listeners with a life-affirming musical experience. Aykanna is comprised of husband and wife Sukhdev and Akahdahmah Jackson, and is revered for their deeply soulful, percussion-driven music, based in the advocacy of love and light. Each musical morsel is consecrated with wisdom teachings that Sukhdev and Akahdahmah have each dedicated decades of their life work to spreading across the globe. 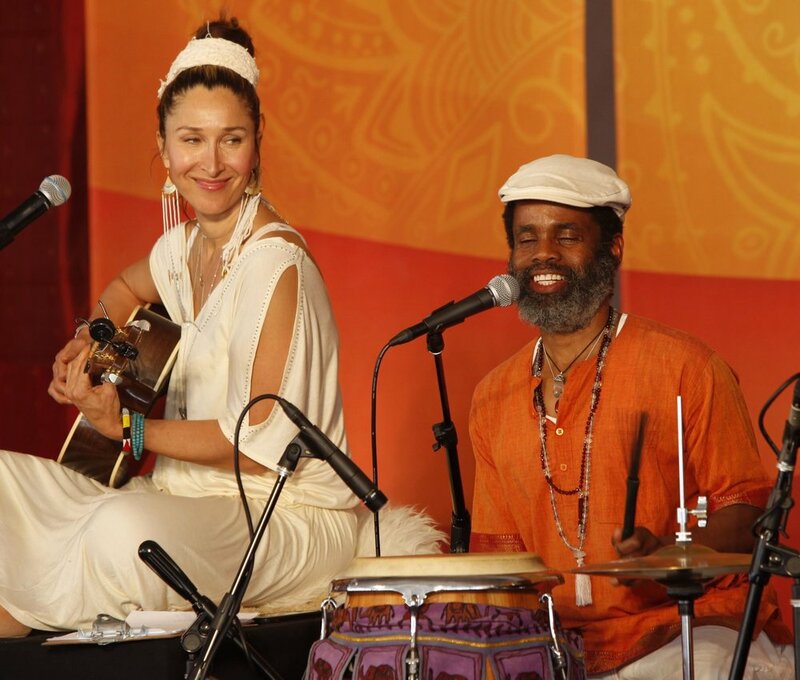 Accordingly, the duo graces retreats, concerts and workshops worldwide with their love for the Kundalini Yoga teachings. Sukhdev and Akahdahmah share a profound passion for Kundalini yoga, sacred chant, and healing for all. Their musical style is richly infused with the sacred chant traditions of India as well as powerful elements from ancient shamanic heritages. It is a high-vibrational, inspiring genre that stretches beyond the boundaries of Kirtan and new age music, and into the hearts of all people. Aykanna performs and teaches at Sat Nam Fest, Wanderlust, Hanuman Festival, Yoga Journal Conference and 3HO’s Summer Solstice Sadhana Celebration, as well as internationally in Central America, Europe and throughout the US. They are currently pouring their creative devotion into a new album, to be released in Summer of 2018. Akahdahmah and Sukhdev live with their delightful 5-year old daughter, Sahej-Rose in Ojai, CA. Amidst a new generation of Kundalini Yoga teachers, Sukhdev Jackson shines bright as one of the prominent international influences. Integral to the success of the world-renowned musical duo Aykanna, Sukhdev is a “Billboard Magazine” acclaimed musician with a diverse career spanning over 20 years. Mantra technology and women’s empowerment trainings are among her main areas of passion and expertise. She is the creative force behind "Shakti School”, which she founded to enliven the divine feminine essence within women. She utilizes the ancient trainings of Kundalini Yoga to serve and train women to develop their true power. She lives with her wonderful family in Ojai, CA. Follow Sukhdev on Instagram and Facebook to tune into Women’s Wisdom and Inspiration.